Royal Society Open Event on Flooding From Intense Rainfall. 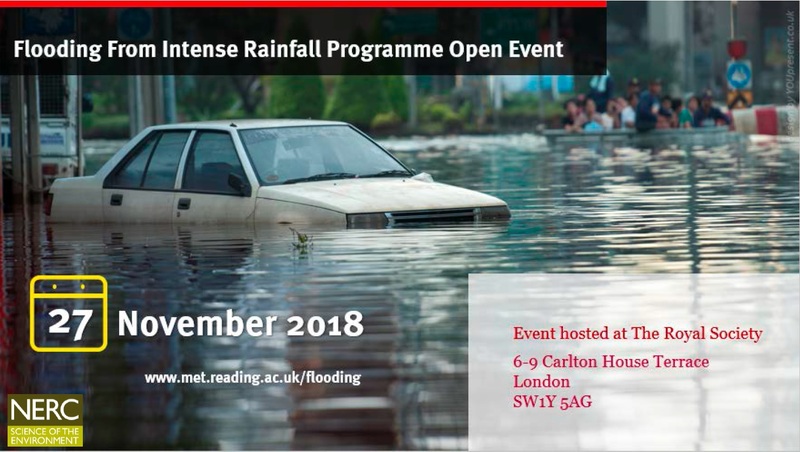 The Open event for the Flooding From Intense Rainfall event will be held at the Royal Society, Carlton House Terrace, London on Tuesday, November 27th. We are very much looking forward to seeing you next Tuesday 27th November, at our FFIR Programme Open Event at the Royal Society, 6 – 9 Carlton House Terrace, London, SW1Y 5AG Tel : +44 20 7451 2500. A copy of our Expenses Advice document, for claiming back your Travel expenses is here. There will be free Guest WiFi access at the event and the access/password can be provided on the day, at the Venue. Please also note that we will be taking photographs on the day, we will be asking you to sign your consent as part of your registration on the Welcome Desk, when you arrive at the Event. Please advise us if you do not consent to your photograph being taken.